Update 9/28/2018: According to a Starz press release, the panel will last from 5:30 – 7 PM on Saturday, October 6th. Diana Gabaldon previously mentioned that she was not invited because the panel was only going to be 30 minutes long, so draw your own conclusions about what you are going to see at this panel. There will be a Starz booth at NYCC located at Inner Roadway #1. Autograph signings will be there on Saturday, October 6th starting at 2:30 PM. 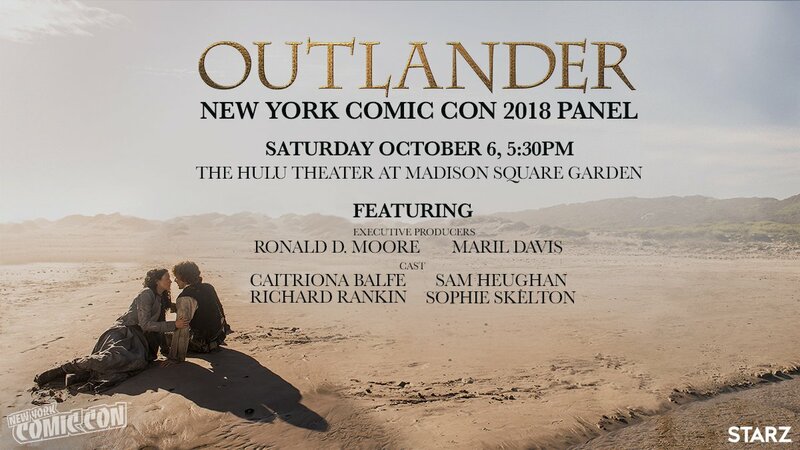 Update 8/25/2018: The Outlander NYCC panel has its official panelists (Sam Heughan, Caitriona Balfe, Richard Rankin, Sophie Skelton, Maril Davis, and Ronald D. Moore), as well as a time and location (The Hulu Theater at Madison Square Garden at 5:30 PM on Saturday). Original Post: Both good and bad news today for Outlander fans. Starz announced this morning that Outlander will be attending New York Comic-Con on Saturday, October 6, 2018. Caitriona Balfe, Sam Heughan, Sophie Skelton, and Richard Rankin will all be in attendance at the Outlander panel at NYCC. If you would like to attend NYCC, please visit their website for all the details. Numerous outlets, including NYCC, are reporting that this will be Outlander‘s first time at NYCC. That is incorrect as the first glimpse of Outlander came from NYCC as Ronald D. Moore and Diana Gabaldon had a small panel, there was an Outlander area on the con floor with production design models and a page of the first episode’s script, and Starz hosted a party for a number of fans that same weekend. Our own writer, Johanna, was representing this site at NYCC that year. You can read all about Outlander‘s first foray into comic conventions by clicking here, here, and here. This entry was posted in Caitriona Balfe, Events, Maril Davis, Richard Rankin, Ronald D. Moore, Sam Heughan, Sophie Skelton and tagged Caitriona Balfe, Maril Davis, NYCC, Richard Rankin, Ronald D. Moore, Sam Heughan, SDCC, Sophie Skelton by Sarah Ksiazek. Bookmark the permalink.